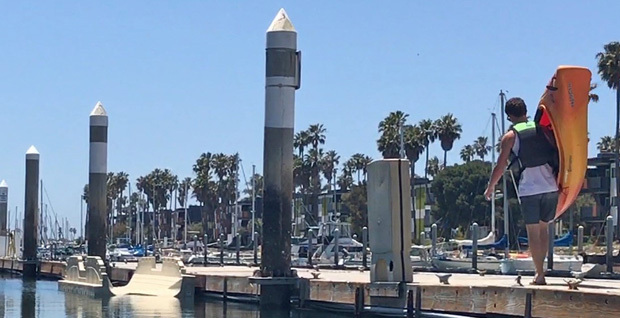 Ventura County officials announced on June 1 the installation of a kayak launch ramp at Channel Islands Harbor in Oxnard. The kayak launch ramp was installed by Ventura County’s Harbor Department and would be available to kayakers and canoe users. The kayak launch ramp features integrated paddle notches, a V-shaped entry and a wide format. The new “EZ Kayak Launch” will be located on the Ventura County Day Dock, near the boat launch ramp. County officials stated kayakers and canoe uses could access the launch ramp at the Curlew Way and Victoria Avenue parking area. Kayakers can still launch from Hobie Beach, the boat launch ramp and day docks around the harbor, county officials said in a released statement. Now Lyn Krieger is stating you can launch from Hobie Beach, but she WILL NOT ISSUE ANY PERMITS! How does she justify her job because for YEARS, she has not fostered our harbor here, but will retire will some of the best pensions in the nation! Dennis Heitmann just retired with his THIRD PENSION. CI Harbor has been dormat for 20 years but he and former Ventura mayor’s (wife) incomes have not been.